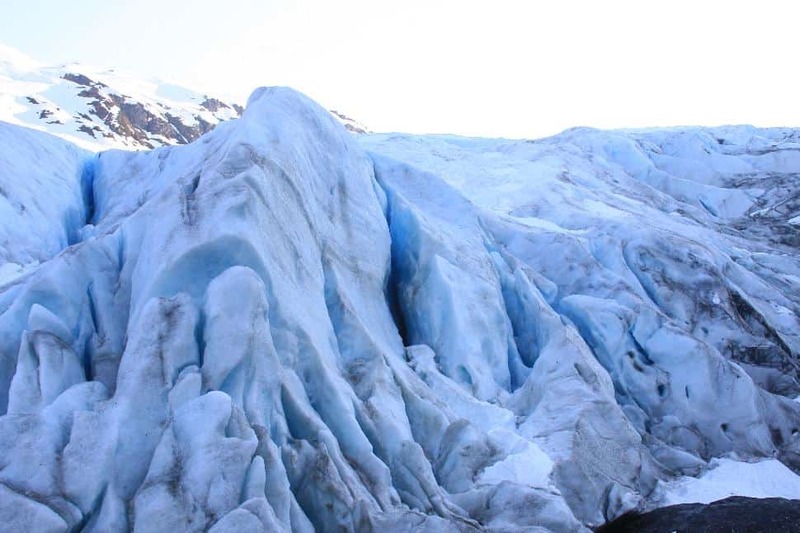 The Exit Glacier is one of the thirty-five glaciers that flow through the extensive Harding Ice Field and the only area of Kenai Fjords National Park that is accessible by car. This accessibility and the deceptive length of the trail have made this particular area popular with curious Alaskan hikers. However, one should not judge this trail on its length as it is actually quite difficult with its steep inclines, unpredictable weather and rough terrain. However, hiking over Exit Glacier and on top of the ice fields provides a view of the area like no other and if visitors can take in the scenery as the hike goes past them, it is some of the best in the state. Getting There: From the nearby town of Seward, Alaska, the visitors center of Exit Glacier is just a short 3-mile drive down Seward Highway until the Herman Leirer/Exit Glacier Road exit. After taking the exit onto Exit Glacier Road, visitors drive roughly 8 miles to the parking lot and the beginning of the hike. This is one of the rare occasions that an Alaskan road is wonderfully paved so visitors in all vehicles types can access and enjoy the area. The Hike: Once at the visitor's center, hikers just need to follow the Exit Glacier trail markers. At first, these lead down a lovely paved trail where hikers can spot markers that show where the glacier once was in recent years. It is believed that the glacier actually stretched all the way down to the town of Seward, about 8 miles away, before it receded to where it is now. Through these markers, hikers get living proof that the glaciers are retreating at a noticeable pace. It's hard to dispute proof of global warming this up close and personal. At the end of the paved trail, by a kiosk that displays information on all the local flora and fauna, the trail splits off into three directions--The Lower Loop, The Upper Loops and The Nature Trail. Hikers will want to take the Lower Loop that will trace the edge of Exit Glacier before heading up onto the Harding Ice Field. Depending on the weather conditions, The Lower Loop can be and easy stroll down a nicely maintained trail or a serious scramble. This trail has a tendency to flood in the warmer months (what with all this melting ice and snow around) so hikers may have to forge their own trail. When the weather does permits, it's is a scenic hike with the only potential from trouble being a short climb down a rock face to the plains below. However, after what is almost a straight shot after that, hikers are treated to the awe-inspiring chunks of blue and white ice that make up the face of Exit Glacier. There will be a number of warning signs alongside the glacier urging visitors not to get too close as falling ice chunks are a danger, but there have been more than a few daring visitors that choose not to heed them. Best not become another example of natural selection and heed the warnings, the views of the glacier are just as stunning from a distance as they are up close. Tracing the glacier is the highlight of The Lower Loop, but like the name suggests it will soon turn from the glacier and head back. It's been less than a mile, so no need to turn back quite yet. Continuing forward along the glacier will put hikers on The Upper Loop Trail. Eventually the trail takes them up a gravelled slope on the glacier so they can experience views from on top of it and will get their first peek at the Harding Ice Field far in the distance. As the trail weaves over the glacier and gains even more elevation, there have been pieces of wood and rock carved into the ice to make it a little easier. Hikers are treated to views over this vast sheet of white with its crevasses juxtaposed against the mountainous back drop. Eventually, the trail will split once again as Exit Glacier gives way into the forest seperating it from the Harding Ice Field. Following The Upper Path Trail will lead back to the visitor's center, but continuing on will lead to the strenuous climb tothe ice field. This is where the hike formally gets difficult. The Harding Ice Field Trail is just over seven miles, but gains roughly 1,000 feet in elevation per mile at times. With any luck, hikers will tackle it on a dry day but fog, rain and poor visibility are common in this area. The weather also makes the trail a little slippery not just on the ice and snow portions but one the dirt trail that is, more often than not, slick mud. After a climb over the icy crags and boulders that comprise the edge of Exit Glacier, the trail turns into thick forest. It will continue as an uphill forest hike for almost the majority of the hike, but it gives hikers plenty of rock formations to climb and check out the ice fields from afar. At about two miles in, the trail rises out of the forest above the tree line and hikers get their first glance at the enormity of this ice field. It seems to stretch on forever into the dull gray sky. However, there is still quite the long climb before hikers will reach it. Through more forest, the trail continues to climb until it finally breaks into surprisingly green and beautiful meadow just on the edge of an icy wasteland. It is in this area where the formal trail sort of disappears. Many forge their own trail either through the ice field or along the edges of it on the meadow and rocky ridges that run alongside. Those that trace the ice field to the half a mountainside they just hiked up will be treated to views overlooking Exit Glacier, providing it's not foggy. For those that want to walk through the ice field, during the warmer months when this trail is often hiked, they will find it mostly icy slush. Unless hikers venture a few more miles into the field, the ice should be fairly safe to walk on with no ice crevasse surprises, but it never hurts to be careful. The field seems to go on for miles far beyond what the eye can see. It is feels much like visitors have walked up to where the green world ends and the ice world of the north begins. It is easy to spend hours exploring the area around the ice field, but eventually hikers will need to go back. This is an out and back hike meaning hikers can just retrace their steps. They can also take the halves of The Lower Loop or The Upper Loop Trails that they missed. However, either half a loop that was missed out on are nothing special compared to the sights that hikers were just treated to.